The CBER Data Center makes data collection simple, visual, and easily accessible. We've collected the latest data sets from trusted primary sources, including BLS, BEA, and the U.S. Census Bureau. Our economic web tools transform overwhelming walls of numbers into a format that is organized, attractive, and useful for people ranging from grant writers and economic developers to community leaders and informed citizens. Regularly updated data sets from primary sources for the U.S., Indiana, and Indiana's metro areas. An objective, data-focused assessment of the factors that influence the quality of life and the economic conditions within each county. This tool estimates the direct and indirect effects of the introduction of a new business to a county. County-level information including demographics, education, health, and social capital. 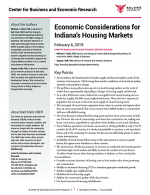 Produced for Conexus Indiana, this report grades state performance on a number of factors that affect the health of the manufacturing industry. Compare daily living costs between states at the county level. County-level information for grant writers regarding demographics, education, health, and social capital. Includes information about Tax Increment Financing and a calculator for estimating	the economic and fiscal effects of new business development. Ball State economist Michael J. Hicks, Ph.D. delivers his personal perspective on current issues in business, government, and society. The Council for Community and Economic Research (C2ER) compiles average pricing data to compare average living costs in cities across the U.S.